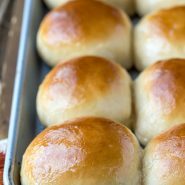 Soft 30 Minute Honey Butter Rolls are made from scratch – start to finish – in just half an hour! My kids have gotten so used to having fresh rolls with dinner that they’re disappointed if we have a dinner without any. So, I keep working on new recipes to make quick rolls that don’t take all night to make, and I adapted this recipe from my 30 Minute Honey Wheat Roll recipe. 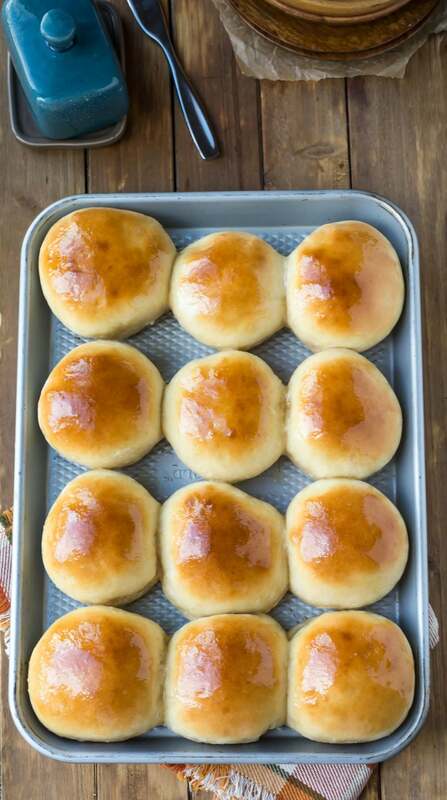 These 30 Minute Honey Butter Rolls are good. And fast. Which makes them perfect for weeknight and weekends alike. Plus, they take less time to make than frozen rolls take to thaw. 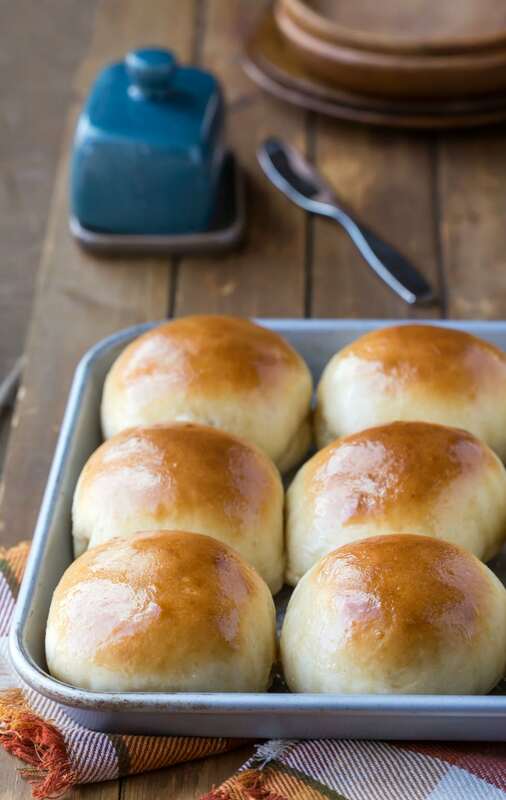 So, if you’re in a hurry and want some fresh bread, give these rolls a try! If you’ve tried this 30 minute honey butter roll recipe, don’t forget to rate the recipe and leave me a comment below. I love to hear from people who’ve made my recipes! You can SUBSCRIBE to receive my latest recipe newsletters or FOLLOW ME on FACEBOOK, INSTAGRAM and PINTEREST for even more delicious food. 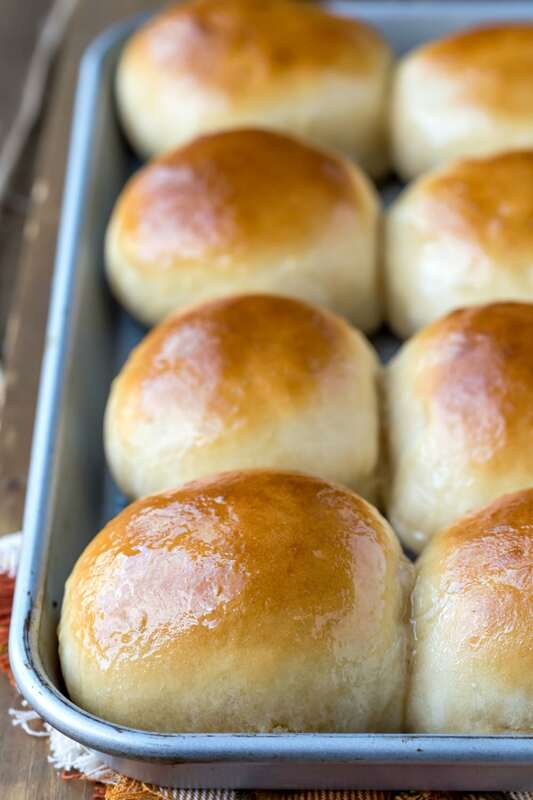 Soft 30 Minute Honey Butter Rolls are made from scratch - start to finish - in just 30 minutes! Preheat oven to 400 F. Lightly grease a quarter sheet pan or a 9x13-inch rimmed cookie sheet. Stir in 2 cups all-purpose flour. Add remaining flour 1/4 cup at a time until dough clings to paddle and cleans the sides of the bowl. Dough will still be pretty sticky. With floured hands, shape dough into 12 rolls, and place dough on prepared baking sheet. Bake for 10-12 minutes, or until lightly golden brown. When rolls are done baking, brush with 2 tablespoons melted butter. If you would prefer to use active dry yeast, substitute an equal amount for the instant yeast. After step 5, let the mixture sit for 5-10 minutes, or until foamy. Then, continue with the recipe as written. *There are 2 1/4 teaspoons of yeast in a packet. If you are using packets, you will need 3 packets to give you 6 teaspoons (which is the equivalent of 2 tablespoons) of yeast. **Since the rising time is so short, it really helps the rolls to rise if they are in a warm spot. If your kitchen isn't warm, simply preheat your cold oven to 350F for exactly 60 seconds. Turn the oven off, and you now have a great spot for your rolls to rise. Could you substitute sugar for honey and how much? I live 20 miles from town and dont have honey on hand. Without having tested it, I’m hesitant to recommend subbing that much honey with sugar. If you don’t have honey, this roll recipe might work better for you. Please let me know if you have any other questions. These rolls were absolutely delicious! I made them to go with some homemade chicken soup and it was so good! The honey is what made this! I prefer honey over sugar, and that is what caught my eye when I was looking for a recipe. And the recipe was easy to follow and done quickly! Thank you for this! Thank you! I’m so glad that you liked the rolls! I can imagine how good they were with the soup. =) Thank you for coming back to comment! Hey! I am also an avid cook and I bake nearly every day. Also, I make homemade bread, baguettes, galettes, sauces, truffles, lollipops, so many things! My husband calls me his personal chef. I’d concur! I digress; my question is do you have a method for prepping and storing for later usage? (Example, prepare recipe up to a certain step, then stop and package in plastic wrap and maybe an airtight container and freeze or refrigerate?) How would that work for this particular recipe, as I am absolutely dying to give it a whirl?!?!?! I’ve made these twice now up through step 9, then put them in the fridge, took them out an hour before baking to rise from being chilled and both times turned out great! Rave reviews from family and coworkers. I made these tonight for our Thanksgiving dinner. They were delicious and not one was left. I also made some gluten free for children and just switched out the flour for the Bob Mills Gluten free 1 to 1 flour mix. They turned out great. Thank you so much for this recipe! Thank you so much! I’m glad that they were a hit. =) And thank you for your note about using GF flour. That’s very helpful. Hi Kate! Oh my Gosh! I gotta tell ya, Sister. This recipe is THE one, the go to KEEPER,period. I finally feel like a real baker, yippee! I’ve never posted a single comment on anything, ever. I’ve never used social media or had an account with any of them in all these years, and I learned computing when we still used floppy disk, ha! I’m so inspired by this recipe though that I just had to let you and your readers know. I think that there are plenty of other people who come and take a peek but just aren’t commenters. I usually read reviews because I feel like sometimes I can find hints and tips in other people’s experiences or mistakes. We all make them, and I did too initially. Although that first batch was “doughy” and dense, they were still soft and pretty delicious anyway. So, I wanted to try again and came back for a second look to see if I could get to the bottom of it. I do believe that I have solved the mystery. I only realized it by reading again the 2 T = Tablespoons, subsequently your clarification of that fact in a reply to a comment, and lastly someone else’s comment that perhaps their yeast was a dud because 2 of the 3 packets that they had used performed the same way. I used 1of 3 packets the first time as well but it was my last packet of instant. All that I had left was a jar of active dry yeast, not a fast acting yeast. I read your tip about just taking the 5-10 minutes to proof it, and simply carry on with the recipe as written. When I began to scoop out the 2 Tablespoons, it dawned on me. The packets are only 2 1/4 teaspoons. It would take nearly 3 packets to meet what the recipe calls for. It’s a simple and easy mistake for a fairly new baker, like myself to make. I sure hope that will encourage others to try it and not discredit your recipe for fear of a “doughy” outcome. It’s that time of year where folks are searching for their Holiday rolls recipe. If they try this one, their search will be over forever. For the record, I’m going to continue using the same recipe with one 2 1/4 teaspoon packet to roll out and twist for soft pretzels, it’s perfect for that. When I want the big fat yeast rolls, 2 Tableapoons it is! Thank you again! Happy Thanksgiving! These are rolls are excellent! The rolls came out great! what a time saver. These were delicious! I ended up with 16 rolls! I am not experienced with yeast and the last recipe (cake) I attempted using instant dry yeast did not turn out, so I was not expecting much. I used the preheated oven to sit my rolls on top of with a tea towel on top but they still had barely risen after 10 min. So after reading the comments, I let them sit longer with “press and seal” wrap on top, about 15-20 more minutes. The rolls rose a little more and finished rising in the oven. My family loved them too! Thanks for a delicious recipe!? Thank you! I’m glad you were able to get them to rise. =) Thank you for coming back to comment!